Do you know how to read a fraction number line? That there have been warnings by the bureau of meteorology that flash floods are soon to arrive, and we need your help evacuating all the forest creatures in preparation for the worst to come. You will head out into the forest to find the hidden creatures. The team has rescue points for the creatures to gather at as they await rescue. You have specified the location of each creature in the form of fractions on a fraction number line. By studying the fraction given, identify where you believe the rescue point might be on the number line. To perform a rescue, drag the spaceship to the rescue point by sliding it across the line. If you get the rescue point correct, you will successfully beam a creature up and into the spaceship. If you get the answer wrong, you will find yourself beaming up some very unwanted items, from stinky boots, to empty bottles, to fishy bones. Please do not give up, because the fate of these adorable creatures lies in your very capable hands! A fraction represents a broken part of a whole number. Fractions consist of two parts: the numerator is the name of the number that is above the line, and the denominator is the name of the number below the line. While the numerator signifies a number of equal parts, the denominator tells us how many of those parts make up a whole unit. Number lines are commonly used for measuring, but it has become a great tool for learning to count, between addition and subtraction, to multiplication and division. 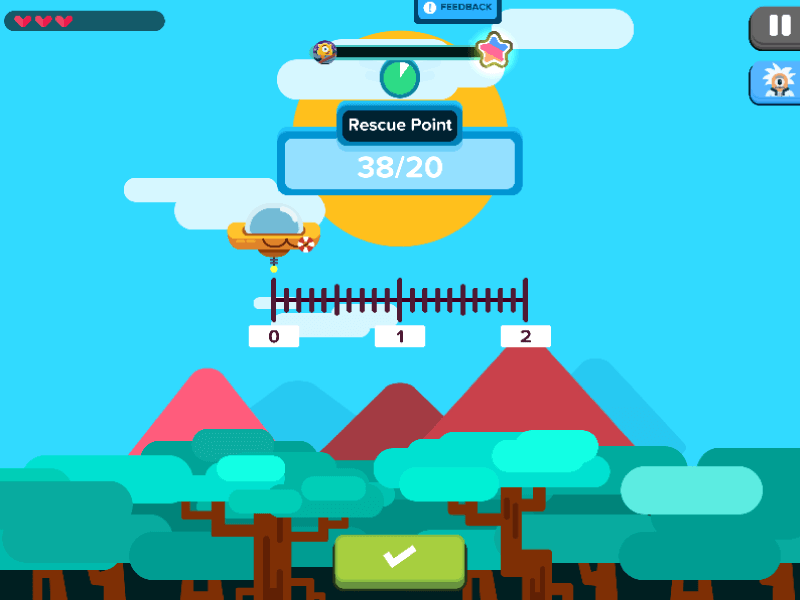 In previous games, you will have studied calculating objects organised in a number line, therefore counting fractions on a fraction number line merely encourage you to demonstrate and increase your skills further. Fast Fraction Line is a game that shows you how to solve problems with fractions. It combines the concept of counting on a number line with the basics of reducing fractions to their lowest terms of prime factors and counting them up again. Rescue creatures with a number line!